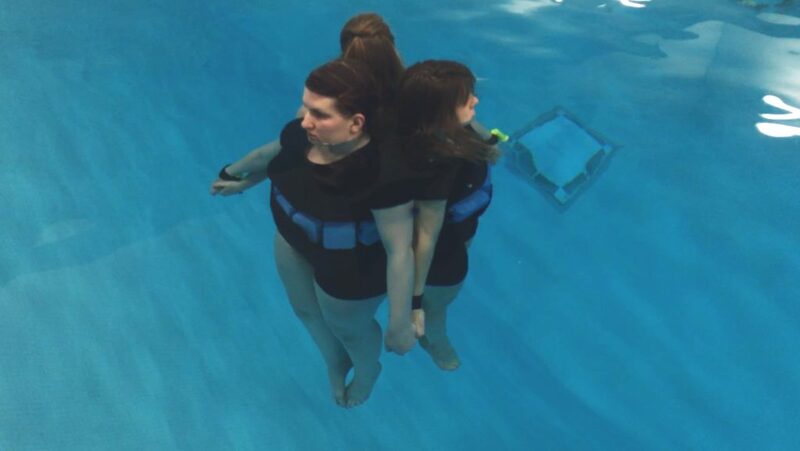 Lawrence University’s Banta Bowl has always been a home to winners, but the facility itself is now a winner as well. The recently renovated Ron Roberts Field at the Banta Bowl has received an award from the American Sports Builders Association (ASBA). The new-look Banta Bowl, designed by Rettler Corp. of Stevens Point and constructed by The Boldt Co. of Appleton, was honored in the Distinguished Field Facilities category. Renovated in 2015, Lawrence’s Banta Bowl was recognized by the American Sports Builders Association with an award as a “distinguished field facility. The naming of Ron Roberts Field at the Banta Bowl honors Lawence’s legendary football coach and long-time director of athletics, Ron Roberts, at the behest of Tom Rogers ’65, who gave the lead gift for the renovation. The Banta Bowl would not have been possible without the generosity of George Banta Jr. ’10. Originally called the Lawrence Bowl, the stadium was an anonymous gift from Banta and was renamed in his honor after his death in 1978. 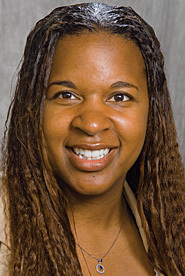 Christyn Abaray is the new Lawrence University Director of Athletics, President Mark Burstein announced today. 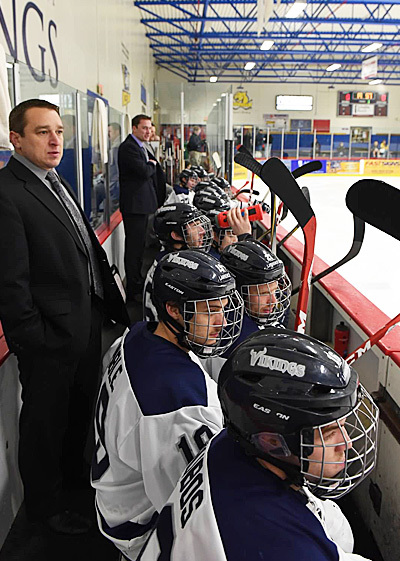 Abaray takes over for Mike Szkodzinski, who announced this past spring he was stepping down to devote his full attention to coaching the Vikings’ ice hockey team. 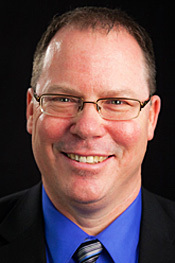 Abaray has served as director of athletics at Buena Vista University in Storm Lake, Iowa, since June 2012. Abaray was selected after a national search that resulted in an applicant pool ranging from coast to coast, according to Burstein. “We were very fortunate to have many talented individuals interested in joining Lawrence thanks to the momentum established by Mike Szkodzinski and our coaching staff,” Burstein said. Part of Abaray’s motivation for joining the team at Lawrence was the potential of the Vikings’ athletic program. “I truly feel that Lawrence is in prime position for athletics success with its dedicated coaching staff and its aspirations for more, with its commitment illustrated by resource allocation to human capital and by improvements in the physical plant,” Abaray said. Abaray currently oversees 19 intercollegiate teams and a group of more than 40 coaches and staff at Buena Vista, an institution of 1,225 students that competes in the Iowa Intercollegiate Athletic Conference. She also serves as the college’s Title IX coordinator. During more than three years at Buena Vista, Abaray oversaw the conversion of the athletic department’s in-house website to PrestoSports and was a player in a fundraising effort for new lights at the baseball and softball complex. Abaray noted that during her tenure at Buena Vista, she has worked to build a strong sense of community within the athletic department along with more integration of athletics into the larger fabric of the university. Colleagues at Buena Vista describe Abaray as a great thinker, honest, tough, compassionate, accessible and a wonderful advocate for her department. Abaray spent nearly eight years working at Swarthmore College in Pennsylvania before her stint at Buena Vista. She joined the Swarthmore staff as the assistant director of athletics in August 2004 and was promoted to associate director of athletics and senior woman administrator in 2007. From that point, Abaray supervised all sports, coaches and fundraising accounts. Abaray also served as the department’s compliance coordinator, was a liaison for the Dean’s Office and the adviser for the Student-Athlete Advisory Committee. While completing her master’s degree in exercise and sports science at the University of North Carolina from 2001-03, Abaray served as an intern in the athletics business office. Abaray is a 2001 graduate of Washington University in St. Louis where she earned bachelor’s degrees in anthropology and environmental studies. Abaray, who was inducted into WashU Sports Hall of Fame in 2011, was a four-year starting defender for the women’s soccer team. A three-time first-team All-University Athletic Association and All-Central Region selection, Abaray earned All-America honors from the National Soccer Coaches Association of America in 1998. 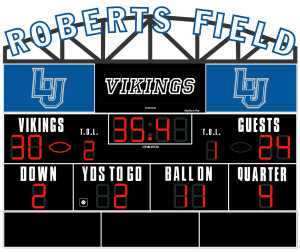 The name Roberts Field will sit atop the new scoreboard in the Banta Bowl. APPLETON, Wis. — The field of the renovated Banta Bowl will honor legendary Lawrence University football coach Ron Roberts, university officials announced. Roberts Field at the Banta Bowl is the new name of the facility where Lawrence’s iconic coach prowled the sidelines for 20 seasons. The naming of the field was done at the request of Tom Rogers, Lawrence class of 1965, who provided the lead gift for the stadium renovation. “It was a fitting way to recognize what Ron Roberts had done for Lawrence. He just did an amazing job,” Rogers said. Rogers was a student at Lawrence when Roberts began his coaching career in Appleton. Rogers was a soccer player who helped establish that program at Lawrence, but he was impressed by what Roberts did for the football team. Lawrence Director of Athletics Mike Szkodzinski said this is a fitting tribute to a Lawrence legend. Ron Roberts, left, coached the Lawrence football team for 20 seasons, won six Midwest Conference championships, reached the semifinals of the 1981 NCAA Division III playoffs and compiled a record of 121-54-1. Ron Roberts served as Lawrence’s head football coach from 1965-83 and for a single season in 1992. His teams won six Midwest Conference championships and reached the semifinals of the 1981 NCAA Division III playoffs. 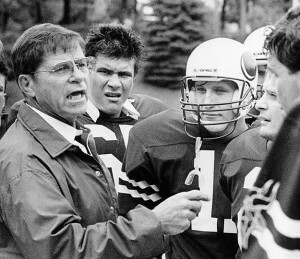 Roberts compiled a career record of 121-54-1 and retired after the 1992 season with the 12th-best winning percentage (.690) in NCAA Division III football history. Ron Roberts passed away in December 2012, and Marlene said their three children, Ron Jr. ’84, Carrie ’86 and Elizabeth, were excited to hear the news about Roberts Field. The Banta Bowl, which celebrates its 50th anniversary this fall, is in the midst of a renovation project that will give the historic stadium a facelift. Lawrence has received $4.15 million toward the goal of $4.5 million for renovations. Lawrence’s Development Office is in a final push to complete the fundraising campaign. The stadium floor will be raised and expanded to accommodate both football and men’s and women’s soccer. The grass field is being replaced with FieldTurf, an artificial surface that will allow more use of the facility. 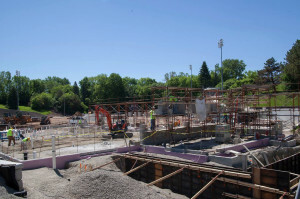 Construction work on the Banta Bowl is progressing rapidly and scheduled to be completed in September. A new building is currently under construction that will house the Lawrence locker room, a visiting team room, bathrooms, concessions and ticketing. The concrete structure of the stadium will be covered and new bleachers will be installed. 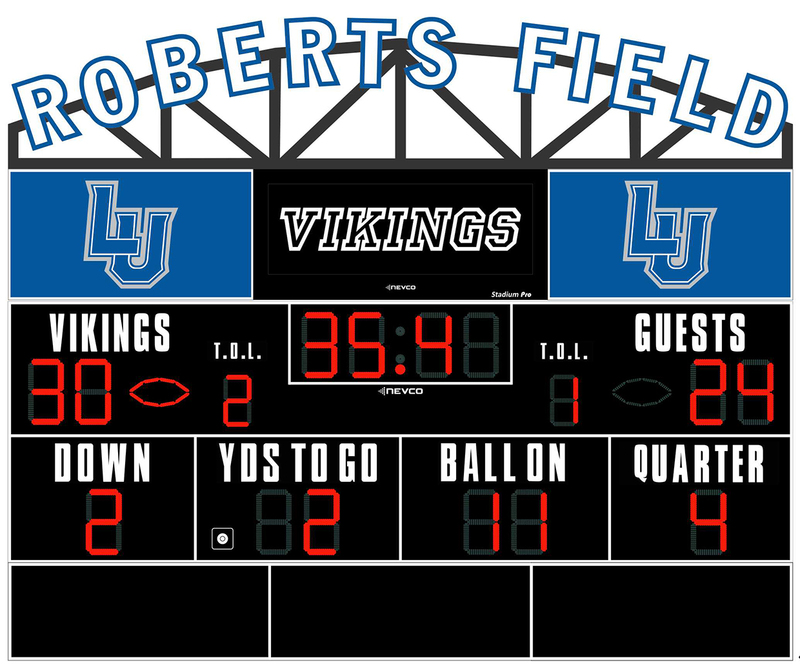 A new scoreboard and sound system are also set to be installed. A memorial to Bernie Heselton, long-time coach and director of athletics, is set to be included in the renovated stadium. Heselton served as Lawrence football coach from 1938-64, won six Midwest Conference championships and compiled a record of 111-79-5. A fundraising effort also is under way to include a memorial for Carl Berghult ’64, a friend and fraternity brother of Rogers. Berghult, a native of Chicago, Ill., was a running back for the Vikings and played in the final years of Heselton’s tenure. After graduating from Lawrence, Berghult was a lieutenant in the United States Naval Reserve, and he was killed in the flight deck fire aboard the USS Enterprise on Jan. 14, 1969. 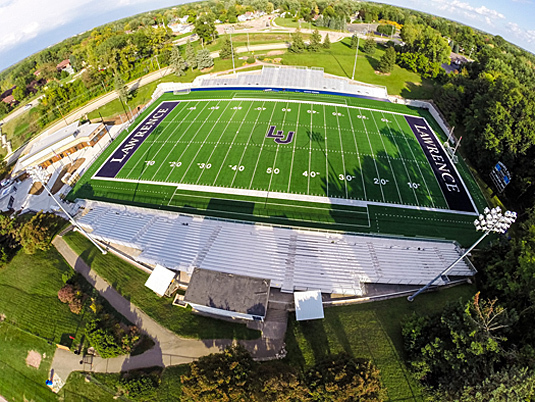 The aggressive construction schedule calls for having the field completed when Lawrence opens its football season with a non-conference game against Rockford University on Sept. 5. Ron Roberts was the first-year head coach of the Vikings when the stadium, a gift from George Banta Jr. ’10 that was called the Lawrence Bowl until 1978, opened in 1965. Lawrence christened the stadium with a 26-21 victory over St. Olaf College on Oct. 2, 1965. A native of Chicago, Ill., Ron Roberts earned a bachelor’s degree in history and physical education and a master’s degree in educational administration from the University of Wisconsin. A Professor Emeritus of Physical Education at Lawrence, Roberts earned an advanced degree from the University of Chicago and a Ph.D. in educational administration from Brigham Young University. A charter member of the Lawrence Intercollegiate Athletic Hall of Fame, Roberts came to Lawrence in 1963 as the offensive line coach under Heselton. Roberts, who was inducted into the Wisconsin Football Coaches Association Hall of Fame in 1996, also coached the wrestling and men’s tennis teams upon his arrival in Appleton. Roberts won his first Midwest Conference championship in 1966 as the Vikings finished 7-1. In just his third season, the 1967 squad finished 8-0 to become only the fourth unbeaten, untied team in school history and won another conference title. Roberts’ teams would go on to win four more conference championships (1975, 1979, 1980, 1981). 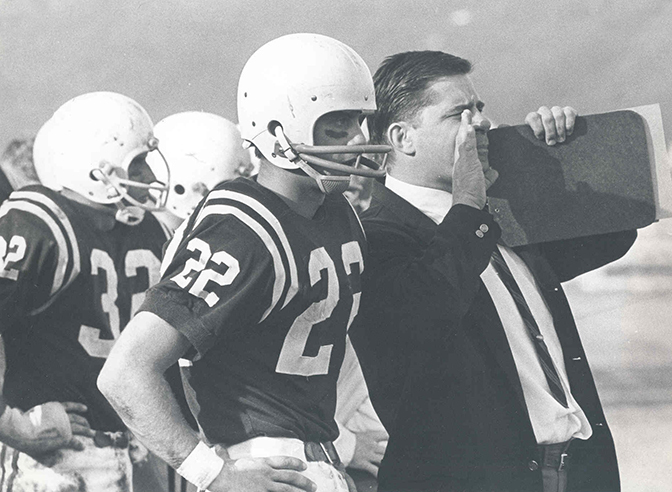 Ron Roberts, right, shouts instructions to the field while being flanked by All-America quarterback Chuck McKee ’68. 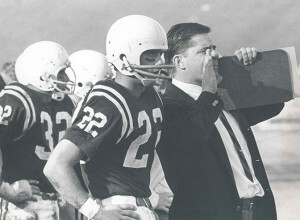 McKee helped lead the 1967 team to a perfect 8-0 record. In Roberts’ tenure as head coach, the Vikings posted 14 winning seasons, including an impressive 10-year stretch from 1974-83. During that time, Lawrence never lost more than two games in a season and posted a 77-15 record. Lawrence also put together a school-record 18-game winning streak during that time. The 1981 season was perhaps the pinnacle of Roberts’ coaching career. Lawrence won the Midwest Conference championship and finished with a 9-0 regular-season record (10-1 overall). Lawrence then became the first Midwest Conference team selected for the NCAA Division III playoffs. Lawrence also became the first Midwest Conference team to host, and win, a NCAA playoff game when Lawrence defeated Minnesota-Morris in the quarterfinals. Lawrence was finally eliminated in the national semifinals but no Midwest Conference team has ever advanced farther in the Division III playoffs. Roberts, who also was Lawrence’s director of athletics, stepped away from football after the 1983 season but returned to the team to coach the 1992 season before retiring. When Roberts finished coaching football, only Cornell College’s Jerry Clark had won more games in the Midwest Conference. Roberts also served as the head coach of the wrestling, tennis and track teams during his time at Lawrence. Roberts coached the wrestling team for 19 seasons in three different stints (1963-69, 1972-74, 1985-93). He coached the men’s tennis team for six seasons from 1964-69 and the team won the 1968 conference championship. Roberts took over as director of athletics following Heselton’s retirement in 1971 and oversaw the introduction of women’s varsity sports at Lawrence. Women’s basketball, soccer, volleyball, cross country, tennis, track and field, swimming and softball all began varsity play during Roberts’ tenure as director of athletics. 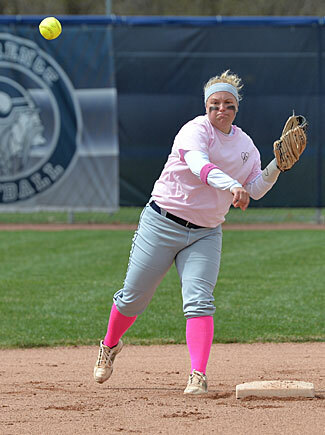 Lawrence University softball star Amanda Jaskolski has been named the Midwest Conference Player of the Year for the second consecutive season. Lawrence senior shortstop Amanda Jaskolski was named the Midwest Conference Softball Player of the Year for the second consecutive season. Jaskolski (Shawano, Wis./Shawano), a senior shortstop, earned the honor after leading the conference in several offensive categories and helping Lawrence to the North Division title. Sophomore catcher Sam Belletini (Gurnee, Ill./Warren Township) also was named to the first team, and senior pitcher Liz Barthels (Sheboygan Falls, Wis./Sheboygan Falls) was chosen for the second team. Jaskolski, who was the North Division Player of the Year in 2014, hit .462 on the season with 37 runs scored, 13 home runs and 46 runs batted in. She led the league in on-base percentage at .573 and was first in RBIs, homers and walks (31) and finished second in hits, slugging percentage and runs scored. Jaskolski decimated the Lawrence season records in 2015 by tying or setting six marks. 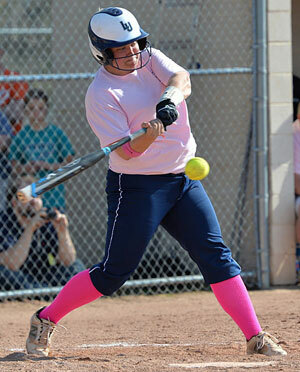 Her 13 homers eclipsed the record of 12 set by Carli Gurholt in 2009 and her 46 RBIs topped Gurholt’s 2009 mark of 45. Jaskolski obliterated the total bases record with 104. The mark was 79, set by Jenny Burris in 2001 and Gurholt in 2009. Jaskolski’s 54 hits broke the record of 51 set by Burris in 2001, and she tied Burris’ record of 37 runs scored in 2001. Jaskolski also smashed the season walks record as teams consistently pitched around her. Jaskolski drew 31 walks, topping the mark of 22 set by Stephanie Ash in 1992. Senior Amanda Jaskolski battered the Lawrence record book this spring, tying or breaking six season marks. In conference play, Jaskolski hit .439 with three doubles, three homers and 12 RBIs. Jaskolski also was walked 15 times, which helped her score a team-best 16 runs in league play. Belletini had a tremendous season behind the plate for the Vikings and was named to the all-conference team for the first time. Batting in the clean-up spot, she hit .367 with 13 doubles, four homers and 24 RBIs. Belletini, who was named the conference Player of the Week twice in 2015, tied the season doubles record set by Alex Goodson in 2009. Belletini also was very good defensively and threw out eight of 18 runners attempting to steal. In Lawrence’s 14 conference games, Belletini hit .551 with seven doubles, four homers and 13 RBIs. He had a .600 on-base percentage and a staggering .939 slugging percentage. Barthels also was honored on the all-conference team for the first time. She went 13-6 with a 1.97 earned run average, the ninth-best season ERA in school history. In a team-high 117 innings pitched, Barthels struck out 44 and walked just 10, an average of 0.6 per seven innings. Named the conference Pitcher of the Week once during 2015, Barthels tossed a pair of shutouts and picked up two saves. Barthels tossed a three-hit shutout in a 7-0 win over Knox College and allowed just five hits in an 8-0 shutout of Ripon College. In conference action, Barthels posted a 5-2 record with a 2.13 ERA. In 42.2 innings, she struck out 20 and walked just four. Lawrence won the North Division title for the first time since 2005 and finished second in the Midwest Conference Tournament. The Vikings finished with a 28-12 record to post the most wins by the team since setting the school record with 31 victories back in 1999. Lawrence University is set to begin a new chapter by hiring a full-time director of athletics, university administrators announced today. 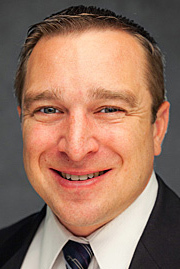 Current Director of Athletics and Head Hockey Coach Mike Szkodzinski said he is ready to return his focus solely to leading the hockey program. Despite splitting time between the roles of administrator and coach, Szkodzinski has put together a record of significant achievements during his nearly six years as athletic director. Lawrence will conduct a national search for a new director of athletics, said Burstein, who praised the work done by Szkodzinski on a variety of fronts. Burstein added that Szkodzinski will remain at the head of the department of athletics, which consists of 20 full-time coaches and staff overseeing hundreds of student-athletes, until a successor is named. 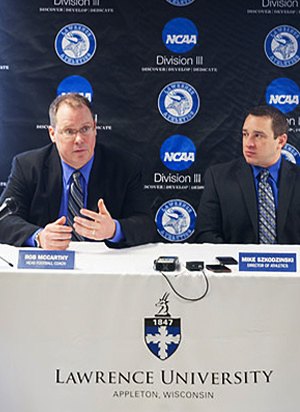 Szkodzinski was named the director of athletics in July 2009 and has coached the Lawrence hockey team for nine seasons. He has balanced that workload with family commitments to his wife, Tori, and three young children. Named head coach of the Vikings’ hockey team in 2006, Mike Szkodzinski has guided the team to the most wins in school history. “This is something I’ve been thinking about for some time and the support of President Burstein and Provost Burrows made it possible for me to hand over the reins of the department of athletics with the confidence that we are moving in the right direction,” Szkodzinski said. The department of athletics has seen a number of changes during Szkodzinski’s tenure. Szkodzinski worked to increase the number of full-time staff members and was responsible for the hiring of standout coaches like Jason Fast (men’s and women’s cross country, track), Lisa Sammons (women’s soccer), Steve Francour (men’s and women’s tennis), Ashley Wellman (women’s basketball) as well as Rob McCarthy, Lawrence’s new football coach. In addition, Szkodzinski has played a leading role in the renovation of the Banta Bowl, which is underway. Szkodzinski’s leadership, in partnership with Lawrence’s development office, has spearheaded efforts to raise more than $4 million for the renovation of the venerable stadium. A renovated Banta Bowl will debut in fall 2015 to celebrate its 50th birthday and serve as the home of Lawrence football as well as men’s and women’s soccer. 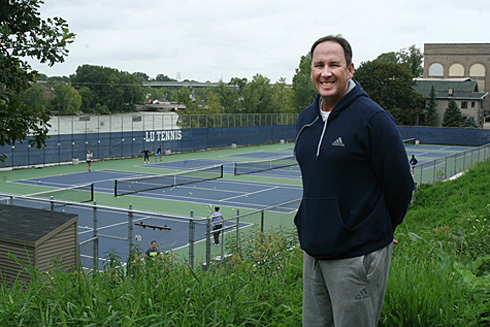 Under Szkodzinski’s leadership, the Lawrence tennis courts were recently resurfaced and had lights installed. Other facilities upgrades include a new track surface for Whiting Field and improvements to Alexander Gymnasium as well as both the baseball and softball fields.